ME AGAINST THE WORLD is a new band with a classic sound from Upper Swabia, a region of Germany. “Breaking Apart”, released 10/12/2018, is the quartet’s debut album, consisting of 11 tracks, many of which are over four minutes in length. The album starts out with “Go Away” whose opening is dominated by classic rock riffs. It features very punk sounding stentorian vocals backed by hefty guitar riffs and fast paced drumming. “Dead or Alive” starts with heavy guitar work and bright cymbal work. The vocals that come in are very static and lend again to a punk influence. The fast pace picks up even more with “Defrauded”. Very quick drumming carries the song through so quickly that a five-minute song seems to fly by. Very hard rock guitar backs rough, throaty fast-paced vocals. The overall fast-paced momentum slows with the next song, “Dying World”. While the guitars and vocals are much slower, the drums keep a very fast pace underneath keeping the song from feeling too sluggish. The overall tone of the song is somber which plays perfectly to the lyrics. The pace picks back up with the faster “Say No More”. A very impressive guitar solo features on this song with quick impressive drum work throughout. “Against the World” begins with very classic rock sounding guitar riffs. The vocals that come in are very raw and rough. The song picks up pace and takes on a punk quality reminiscent of THE OFFSPRING. Catchy, gritty guitar riffs and cymbal work carry this almost seven-minute song. “This Day We Fight” starts with a fast pace but after one verse slows down just to turn around and pick back up in a gritty METALLICA fashion. The sadness felt from the slowed guitar riffs adds to the lyrical content. At six and half minutes long, “Breaking Apart” feels like someone took a 1990’s punk song, mixed in elements of 1970’s rock and some SYSTEM OF A DOWN. It is a dynamic, catchy song. “Eternal Sorrow” starts softly but is quickly overtaken by heavy guitar. The song has a raw, rough feel which is added to by the harsh vocals. The time change in this song supports the vibe giving by the lyrics of moving from sorrow to having the determination to move forward. With a running time of close to ten minutes, “Morgan’s Misery” moves past musical and structural boundaries. The song starts very dark and heavy. The song slows with the verse and the guitar backs off allowing the vocals to stand out against just the drums with an eerie quality given by the wind in the background. An almost tribal chant picks up behind the heavy guitar riffs making this song very catchy. Eight minutes into the song, they drop out everything but the wind sound and the guitar leading up to words spoken by the vocalist. The rest of the song is left with heavy waves of water pushing through to take over the soft guitar before fading out. 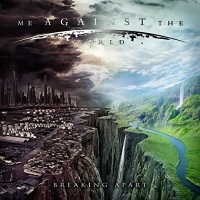 The final song on the album is a catchy radio version of the song “Breaking Apart” featuring a female backing voice. The album breaks from normal structure by switching time and tempo throughout without losing flow. A mix of classic rock, 70’s rock and punk influences can be felt. The music stays exciting from one song to the next. The overall feel of the album is rough and raw which feels quite right for the lyrics which range from personal and painful to political.